← My church…standing in the light. From the rainforest, climbing back up into the Andes. My husband and I have a running joke ever since we met a couple that loved tandem bike riding and was trying to convert us – there are some marriages that can survive tandem biking, and then there’s us. 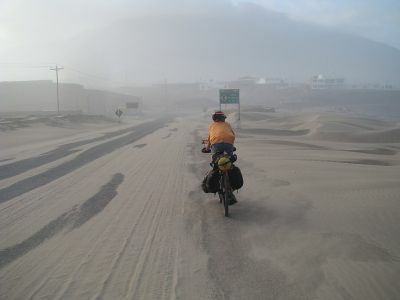 Oh, how fun -- blowing sand in Peru! So it was with utter admiration and disbelief that I stumbled upon Family on Bikes .. a noble/insane endeavor by The Vogel Family — a couple with twin 12-year old boys who are spending 3 years biking 18,000 miles from Alaska to Argentina on the Pan-American highway. Now that’s togetherness! The twins will become the youngest people to cycle the entire highway and the undertaking will benefit Reach the World, an awesome educational organization that interactively links 15,000 students in underfunded U.S. schools with travelers and explorers around the world who share their stories, bring global issues alive, and expand the power of learning beyond the walls of the classroom. But look at what you see along the way! Politics, geography, biology, history – it’s all here in a nutshell, not to mention exquisite scenery and drama – which should make for some pretty awesome Reach The World videos that the family is generating out there on the road and sharing with Reach the World classrooms. And if the Vogels weren’t already making me feel like the original Mrs. Couch Potato-head, these two former schoolteachers are home-schooling their boys along the way. Once I get past my envy/shock/wonder at what would provoke anyone to undertake such a pilgrimage, I’m dazzled at the idea. And I’m thrilled to donate $100 today to support Reach The World since I deeply believe that travel is the most enlightening education of all — and gives you a profound sense of your own possibilities. (Except for the possibility that I would ever climb on a tandem bike). To join me in donating to Reach The World, click here! Or you can donate directly to the Vogels by clicking here. Sometimes you can click for nothing. I totally agree with you about how important traveling is for knowledge. It brings character, and to be honest a cultured person is much better off then an” educated” person. As for the biking families, I’m all for biking together, but NEVER on those multi seating bikes, give the kids a little independence! Wow! I envy you for having the privilege to get some exercise,travel places and have bonding moments with your other half all in one. Something we usually forget and miss when you and your partner are already wed.
I’m just trying to imagine what it’s like on a tandem bike on those days when you’re not quite getting along with each other. On a trip like that, it has to happen, right? But they’re certainly on an unforgettable adventure, as you are, Betty. Thank you for another glimpse into the lives and goals of some amazing people. And congratulations on being Freshly Pressed! If I had kids (and husband) I’d do the same. 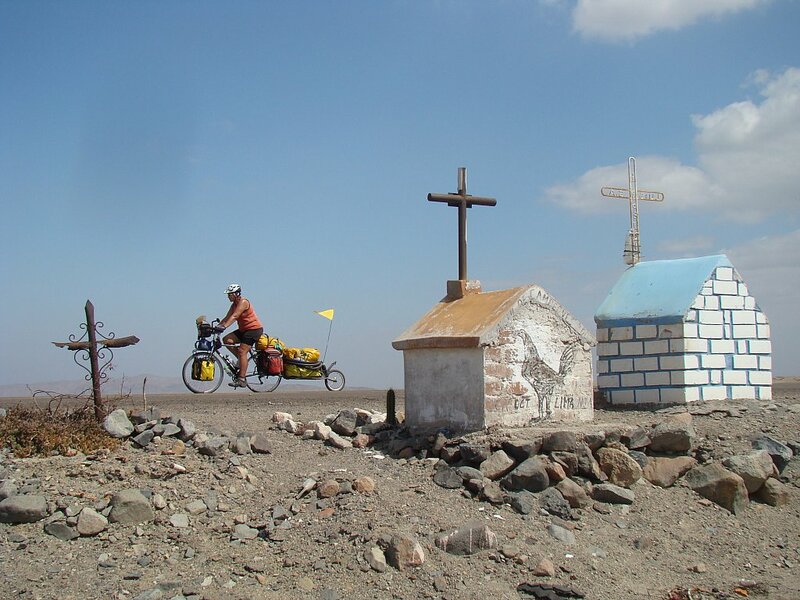 For now I’m alone, so I cycle (around the world) alone. Thanks for the post! I’ve been aware of them out there. Best thing is you can do it too! Wow that really tugs at the heart of my traveling bones….. there were so many more things I wanted to see and places to go…..never put travel and goals off until later….you never know what might happen. 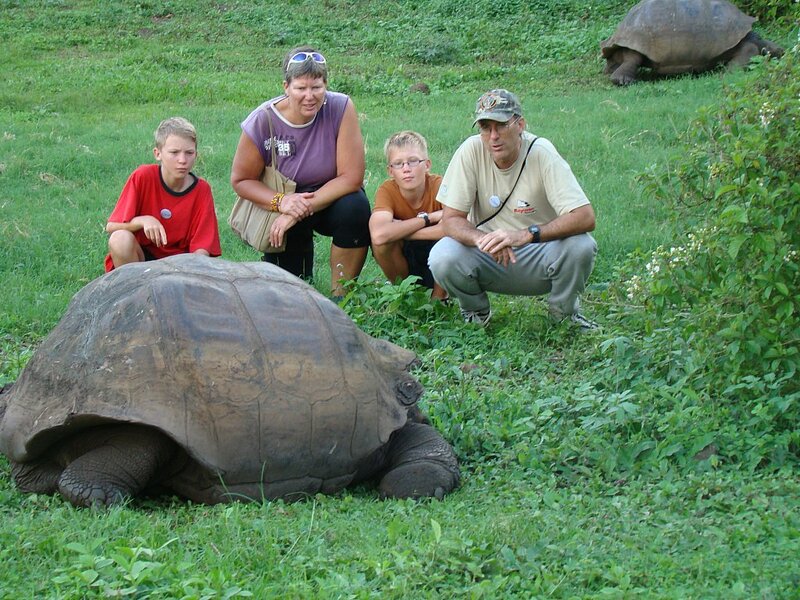 It is fantastic to see a family doing this together and thank you for sharing it with us! 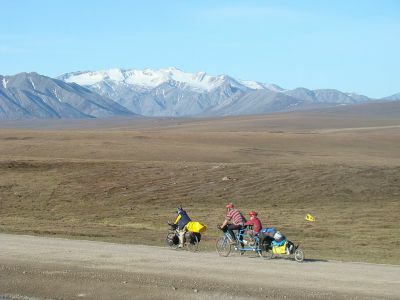 Wow, It’s very fun and happy trip bike around world! I want and I like bike but my bikecycle loss in home. Your blog interesting and inspiring to me, thanks a lot! http://Jendelakatatiti.wordpress.com. That sounds like an amazing journey! Having travelled through parts of South America, a future trip that I’ve dreamed up is driving from the most northern point of Chile to the most southern and then flying to the South Pole. 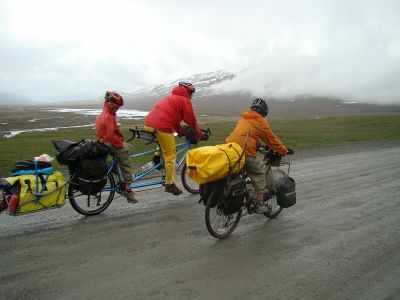 The Vogel’s expedition is making me think I should do it on a bike instead! Mr. Saeed, I don’t know what picture you are referring to, but What Gives 365 is my blog and I am entitled to put any photo I want on it … particularly those expressing my beliefs. I don’t believe in Allah, I believe in Jesus Christ and God the Father — and that is my privilege, just as it is your privilege to believe in Allah and express that in the way you choose. I am actually heading out to Santa Fe in the morning to ride the Santa Fe Rail Trail for an upcoming article I am writing for Rails to Trals magazine– this was just the inspiration I needed. Your donation to the cause was very kind, and I look forward to following the Vogel’s journey the rest of the way! The family is really inspiring.I could never think of doing this and that too being in India.Both the generations are WOW!!!!!! Though I am not one for long bike rides (A quick 6km bike to a friends house leaves me sweaty and unwilling to move for the next week) I find this very inspiring, and almost jealous of the wonders that this family will get to view. It’s my goal to get my behind out of Canada and travel someday, though I think I will stick with a nice, cozy automobile or an airplane. This family has a lot of willpower hun! I think my legs would stop within 3 blocks! But you know something curious?! Me and my boyfriend did not have our own car, so we always go around by bike. Actually He goes cycling, I go back on him … that he makes every effort rough. And you know what??! … Is also very fun!! And cause a big adrenaline rush… Cause we do some downhill with great speed! I think this family should have lots of fun! but also face many difficulties! My dad and I just moved to Alaska from Georgia.. the highways are unbelievably… well.. empty, I guess. It was bad enough driving through… but biking? Really? Count me out. The Vogel family actually said that the Alaska highways (where they started out) were the worst because it was so barren, so empty and so completely lonely – the kids almost bailed on the project right then and there! I cannot even imagine doing what they’re doing — and because I’ve walked along the Pan American highway in Ecuador and Peru (just a few kilometers or so) I can tell you that those roads are totally frightening — huge potholes, tons of pedestrians, gravel flying up from the gigantic trucks roaring by you, diesel fumes …. it’s unbelievable to even conceive of biking there! Wow, I can’t even imagine. Good for those parent, what a chance in a million for that family! Don’t know if it would be for me & mine, but God bless them. I thought I was pretty brave when we up & moved across the country with two teens, Ha, Ha!! What an absolutely amazing idea and project. I myself could not do it, as I would not be halfway around the block from my house before I punched my boyfriend in the neck. We both love bike riding, but like walking for fitness, we do it at very different paces! i think you and I have a similar relationship pattern, kelly G! that’s why the tandem bike thing for us would be … a very bad idea. I completely agree that travel is the most enlightening education of all! Great post, I read with interest. Hmm… it would be interesting to have some kids of the same age comment on this, wouldn’t it? Of course they’d think it was wild that there’s no schooling for three years, and they’d love all the media attention, but the day-to-day non-stop cycling? Across boiling deserts when you’re sick, but mom and dad say you have to? I’m not so sure. I am so inspired by this post. My jaw drops, however, at the response that the parents are “making” the twins go on this trip and taking them away from friends. Friends are friends regardless of space and time. Along the way, the boys are making MORE friends and having experiences to share with their home friends upon their return. Experience and world travel broadens minds. These boys are lucky. The Vogels rock! Thanks for posting. Who knows, maybe MORE people will be inspired to do the same! Family bike trips are great if you set your sights very small. 3 years and 18,000 miles might be a bit much to start out. than travelling the world, I say. I wish I could afford a trip like that. It would be awesome! holy smokes that is one long bike ride! however i am inspired by a family that does this together. great post. WOW, that’s pretty awesome! I am always telling myself that if I have kids myself I am so gonna take them traveling. I really think this is good for them! I’m not sure this is very safe, and my husband would get on my nerves. I can just picture us arguing about which way to go-because he thinks he’s an expert without his GPS. LOL! I am blown away by the comments above which suggest such an undertaking would be detrimental to their children! This is exactly the type of parental attitude that feeds our media obsessed world and prevents the children of today to actually bond with the world around them! What an awesome gift these parents are bestowing on their kids! I mean, if parents did everything their kids wanted them to – there would be no need for parenting! Sure the kids probably grumble and perhaps would prefer to be at home some days, but when they are older and able to understand what an incredible journey they were a part of – they will thank their parents and be proud of their individuality. My parents let me take piano lessons because I wanted to play, but let me quit when I got bored. I so wish they had forced me to continue because I would be able to play today. It’s the same thing. Grow up parents ~ seriously! These children will have more knowledge and understanding of themselves and the world around them than any of their friends (who stayed at home and hung out playing games) when they return. I applaud these parents and wish mine had done the same, because the author of this blog is correct ~ there is absolutely nothing that can top the lessons learned when one travels outside the US. Those lessons last forever, and the family time spent together can’t even be measured with a price. It’s so sad that some parents would actually be against such an amazing undertaking. I agree that travel is the most enlightening education of all, but I’m really not sure about making two 10-year-olds (the twins age when they first set off) leave all their friends for a life on the road. What kids of this age would want to be with no one but their parents 24 hours a day? How do they learn to socialize with their peers? How do they have FUN? Is this really a good idea? This is what one of the kids said when asked if there were ever times that he didn’t want to get back on his bike: “I’ve never said it, but a lot of times I feel that way, especially first thing in the morning when we have to get up really early and pack and it’s freezing”. (http://www.guardian.co.uk/lifeandstyle/2010/jul/31/vogel-family-cycling-america). He said that he used to be in touch with his friends, but all correspondence had dropped off after two years. I think the parents are making the kids carry their dreams. And I think they should perhaps think a little less about fame (is this not what it’s really about? ), and a whole lot more about being parents. Point well taken, Sarah! I know that I couldn’t get my kids to take a weekend bike trip with us if we paid them — but in my heart, I think it’s actually good for them to be independent and able to separate from us. It will be really interesting to see what the rest of Davy & Daryl’s teen years are like — after the Big Ride! While I see your point in regards to the children, I can’t totally agree with you. They’re not Torturing their Children, they’re Offering them a Once in a Lifetime Experience. They’re receiving an education that can’t begin to compare with what most of our children receive. I don’t see them as “making the kids carry their dreams,” more like, they’re kids ARE their Motivation! How many of us want to give our kids the world? They’re doing it! The socializing with peers, I am quite certain that they ARE socializing with people that aren’t their parents. 🙂 It may not be John and Sue from school, but who said that John and Sue are the best tools for communication? The exposure to other people, other ways of life, cultures, etc. will teach them something that associating with John and Sue won’t do (lol, nice rhyme), acceptance/appreciation of/for OTHERS. I think, Sarah, that perhaps getting out of “the world” would aid in seeing that what we think might be the norm is not quite what we thought it was in our own small world (or that which the television media over feeds us). Taking a step back to get a broader and clearer view might give us a more accurate picture of what 10 -12 year old boys really want. Mine want to do things with me and my husband more than anything. Yes, even more than turning their brains to mush in front of a computer screen or Xbox. Shocking, I know, but they want to feel a closeness to us – to know they are our everything. From me, they want to learn how to cook and bake “fancy” things and how to raise and show their animals, build fires, and hunt squirrels. They want to learn “high tech stuff” from their dad so they can create their own computer games. They also want adventure and to play in dirt and crud. They want to be allowed to make mistakes, to be allowed to complain and whine a bit and then come out of their mood all by themselves. They want to accomplish great things – cool things. They want to hang out with each other – especially twins, I can imagine. The Vogels are not doing this for fame. They’re doing this for kids. Kids doing things for kids is incredibly empowering for both the giver and the receiver. As far as socialization…how do these boys socialize? Same as millions of other boys their age, I imagine. Via computer! (lol) Okay, and also face to face with the many new people they meet. Talk about a great way to learn social skills. I’d think they’ll be way ahead of their peers socially by the time they complete their trip. Like you, I am in awe and wonder of this family but with full knowledge that my family could never do something like this. I am jealous just thinking about all of the great things and people they are seeing and meeting. Great Post, and thanks for sharing the effort. Wow…they need to write a book when they are done! Can’t wait til they finish to hear about the whole experience. Pretty amazing. 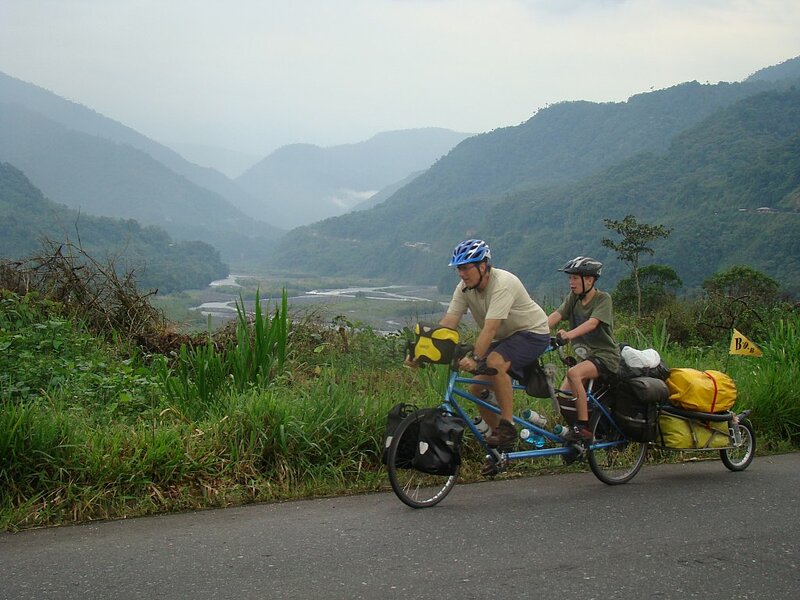 That’s a long time to cycle but you’re right…Travel is the best way form of education. Thanks for sharing the site. Wow! Now if I could only get my 14-year-old twins off their iTouches…. as my husband said –the trick is, you have to disconnect them when they’re 10. if you wait til they’re 14, you’re dead in the water. stuff with us again (as long as we’re paying … it’s magic! Wow, that’s an amazing triumph at such a young (and older) age. Good for them! And good for you for supporting them. Congrats on FP and best wishes in your blogging venture. Both of the stories listed in this post are nothing short of amazing. The Vogel’s…wow! Can’t even imagine, and you…What Gives 365…amazing as well. I think this is such a wonderful idea that you have and am happy to have found you on Freshly Pressed…I look forward to following you for your remaining 365 days!